In today’s market, farmers are looking for every possible advantage. Crop insurance is typically an expensive but necessary risk management tool for producers to protect their income from losses caused by natural disasters. In any given year, about 90 percent of planted farmland is covered by insurance. As a well-known and trusted name in the space, ADM (Archer Daniels Midland) Crop Risk Services is constantly looking at new ways to give their clients the advantage. This takes significant research on technologies that could add a new and innovative approach to the insurance process. Over the past year, PrecisionHawk has worked hand in hand with ADM to build and license a aerial data analysis tool that we are very excited to offer to growers within the DataMapper software. The waterpooling app, available today, automatically and accurately identifies standing water in an agricultural field. This is a particularly valuable toolset for insurance adjusters and growers who, until now, have had to spend a significant amount of time in the field to approximate the extent of damage following an extreme rain event. Walking the property, searching for damage spots, and identifying and agreeing upon a percentage of loss is currently the standard, and often the fields are “impractical to measure”. The research for this app began last summer with data collected by a PrecisionHawk Lancaster. To note, the aerial data can be collected by any drone as long as the data is collected in the near-infrared (with a BGNIR sensor). 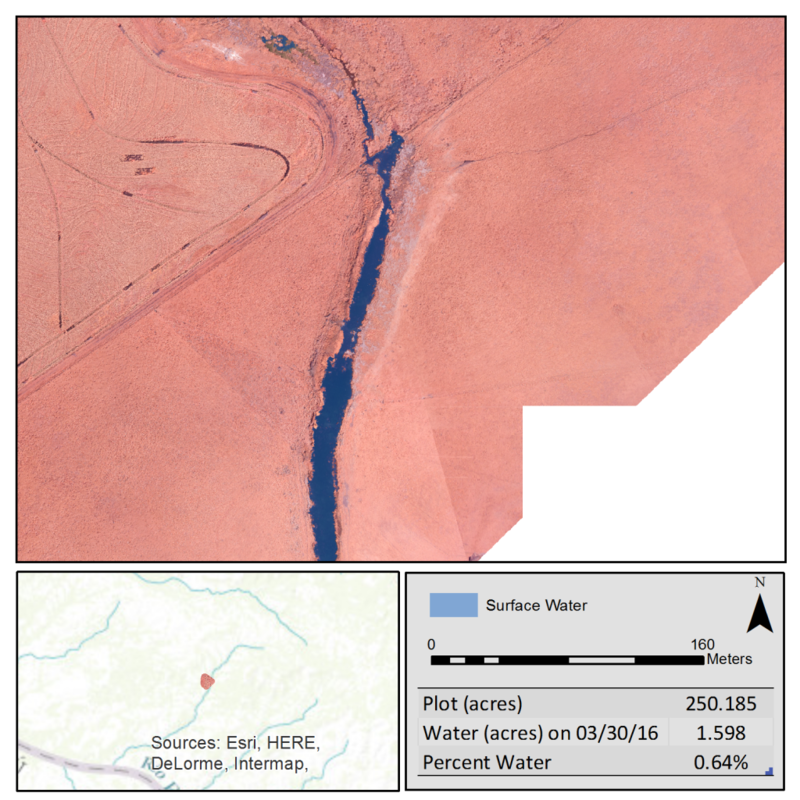 The algorithm segments aerial imagery and, by using water’s natural property of absorbing light in the near-infrared region, identifies areas with the highest probability of being standing water. 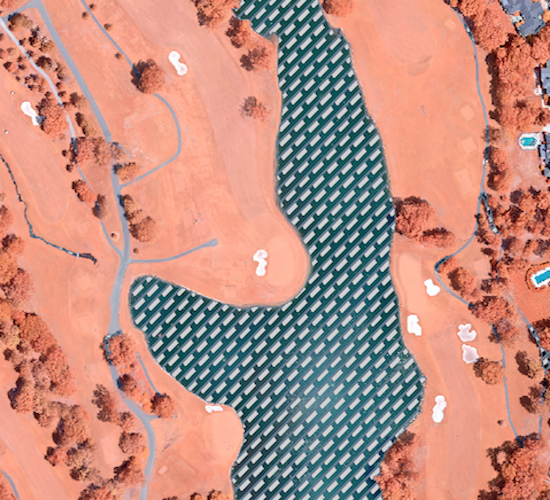 After the drone comes down, the data is processed either locally or in the cloud and is available as a 2D orthomosaic and 3D products within DataMapper. With one click the waterpooling app can determine total acres mapped, total acres covered with water, and the percent of the field that is covered in water. As you monitor the area over time, the grower can get an accurate percentage comparison by stacking each map on top of one another in the DataMapper dashboard. This change detection mapping is well-suited to consistently monitor water levels in a flooded area to know when the area is dry enough and at a state that is ready to plant. Across industries, one of the top selling points for drone technology is the ability to increase efficiency, which typically relays to cost and time savings. In 2014, ADM reported 30,000 loss cases. Today they estimate shaving one minute off all of those cases would equate to a $20,000 cost savings. One of the easiest ways to cut that time is by providing their adjusters with new technology to compliment and streamline their workflow. Every one of the adjusters that we had the chance to speak with during this process was eager to get their hands on the technology. By spending less time identifying the damage themselves and more time with the customer, adjusters are able to better serve as a representative for ADM. This adds that extra level of customer support all while the drone does its job. When adjusters and growers can agree on claims, the client receives exactly what they are due, and ultimately that will reduce the cost for the insurance provider and premiums for the grower. Because crop insurance is strictly regulated through the USDA, crop insurance providers grow their customer base by providing better customer service and faster pay-offs than their competitors. The investment that ADM has made into drone technology and research and development around applications like the water-pooling app shows a strong commitment to providing their client base with both of these things. Ask ADM and they will say an ideal day in the future is where the adjuster goes to the field, the plane flies, they instantly receive a damage report, write a check to the farmer on the spot and go to the next farm. The waterpooling app is available with any DataMapper subscription starting at just $49 a month. You can start your free, one month trial today at www.datamapper.com.